And, lo, though they journeyed but nine days in the wilderness, there passed nigh onto five years before the seventh day of the trip report were posted. “Days 8-9, Out of the Pickets” will be posted later. 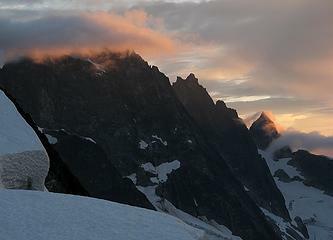 I got up before dawn and walked up to the knoll below Point 6900 to watch the sunrise. 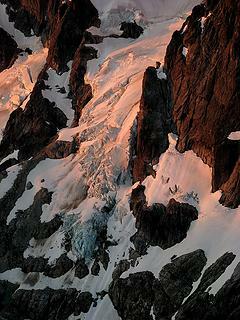 Pink alpenglow lit the Southern Pickets. The sunrise lit up our camp right at first light. 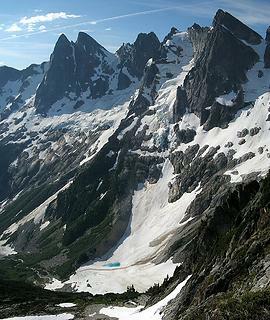 The Degenhardt Glacier looked especially dramatic, tumbling in a steep vertical band from the pointy rock spire of Terror to a tiny blue pond atop the snowy headwater of McMillan Creek. 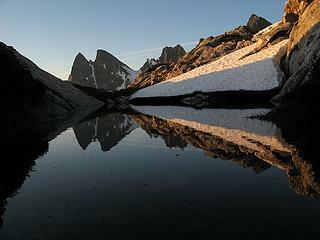 While I was exploring, I had found a small tarn hidden in the rocks above the pass. Since I had packed quickly, I ran back up for Picket Pass swim. 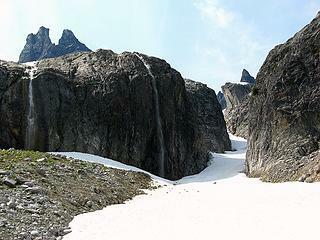 Looking ahead, McMillan Cirque was a magnificent sight. 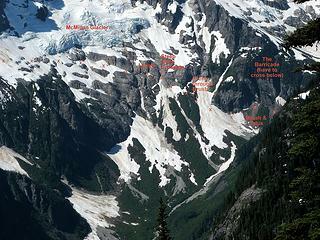 Far below was the brushy valley of McMillan Creek. 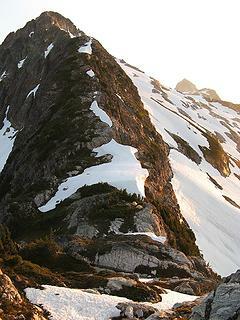 High above were the pointed spires of the southern Pickets. In between curved the glacier-carved southern wall of the cirque, with its hanging glaciers glinting fierce blue defiance at their broken icy edges as they grudgingly retreated back upward from the wall they had carved. 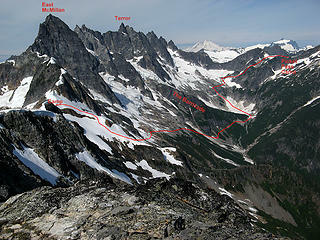 Now it was time to for the traverse of McMillan Cirque that I had been anticipating and dreading for years. 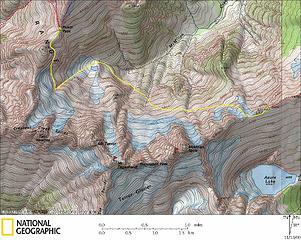 We’d be threading a path through the living intersection of glacier and rock. 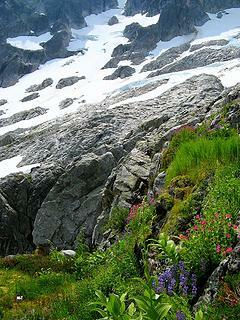 – following the horizontal margin between the steep gray slabs below and the retreating line of white glaciers above. Obstructing our path were the vertical barriers. 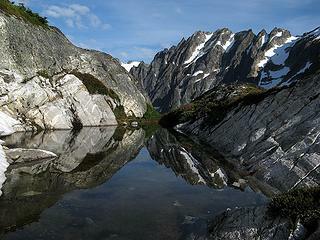 Cut into the slabs were steep hidden rock gullies, barely accessible through the fault lines of ledges. Projecting out from middle of the cirque was the big rock rib of the Barricade. 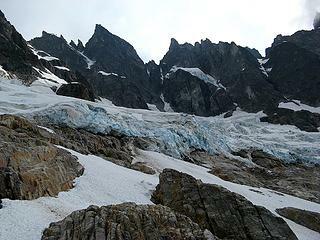 On the near side, the Degenhardt Glacier pointed its icy finger down the top half, and snow filled the bottom half, bounded by moraines marking the huge former extent of the glaciers. 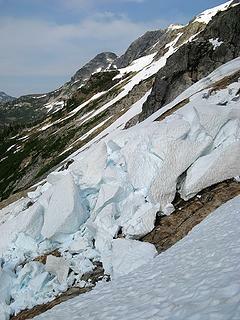 On the far side, the McMillan Glaciers stretched a horizontal band above the slabs. To get past the barrier, we dropped all the way down to McMillan Creek and then worked our way back up. 1. 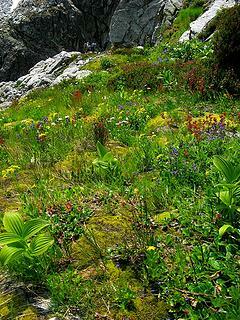 Angle down the blind scary east side of Picket Pass. 2. Cross above the First Broken Slab. 3. Find the Magic Ledge. 4. 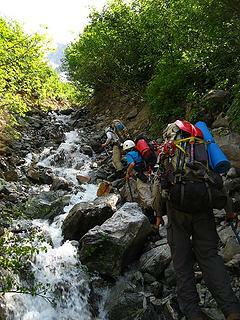 Descend the Enchanted Gully. 5. 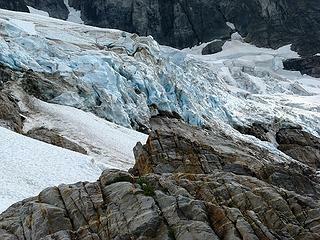 Trot down snow to Degenhardt Glacier Lake. 1. Follow McMillan Creek down past the bottom of the Barricade. 2. Work through talus and brush around the corner of The Barricade. 3. Splash up a creek through the brush. 4. Cross the Leaping Waterfall Gully. 5. 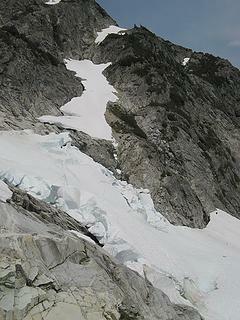 Traverse below the McMillan Glacier. 6. Cross below the Second Broken Slab. 7. 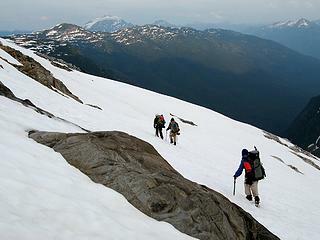 Kick steps up snow to the McMillan-Elephant Col. Here are a couple more photos of the route, taken from the opposite side of the valley in 2010, which was also a higher snow year. The hardest part was getting off the east side of Picket Pass. From above, the route was hidden by its own steepness. We knew where we needed to go, but we couldn’t see it ahead of time, so it was an act of faith to set off downward, a hopeful belief that we could find our way by a combination of the right terrain, our own route-finding efforts, and the guidance of St. Beckey. We were aided by an unexpected miracle – Beckey’s directions, though sparse, were entirely accurate. And all the pieces were there, never easily, and only a little at a time, but each one led to the next till we got down. 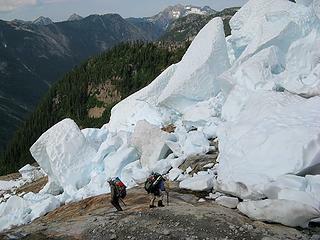 From camp, we walked south uphill toward the base of Point 6900, scrambling down snow onto the side of the pass, then kept angling down and south across various spurs, ramps, and noses, mostly on rock, sometimes on snow. 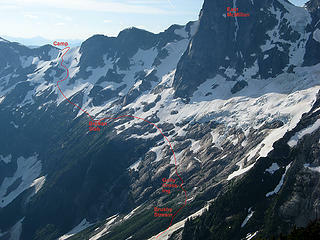 The trick was to keep angling southward across the face of the pass as we descended, and not drop directly down. 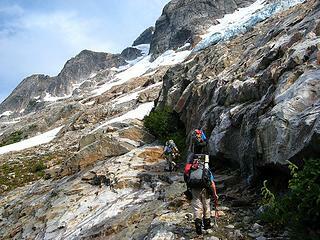 Going down the pass wasn’t very strenuous physically, but it was exhausting mentally. 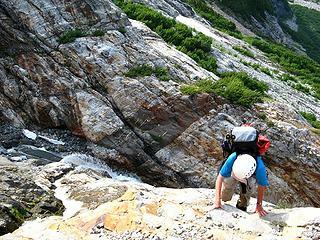 With a heavy pack, steep angle, and immediate exposure, the descent required relentless vigilance. I had enough balance and friction to stay on the slope, but only barely. Slipping or stumbling wasn’t an option here. So for a thousand feet downward, with only a few breaks, I had to stay focused on how I made each step. Not just most of the steps, but every single step. As we worked our way down, I consoled myself with the thought that it would only get better after this. In fact, when we completed today’s passage, I would have accomplished the most challenging trip in my goals, and I’d never have to do it again. Later I’d feel very satisfied to have crossed Picket Pass and fulfilled my wishes, but at the moment I simply felt relieved to have it behind me. 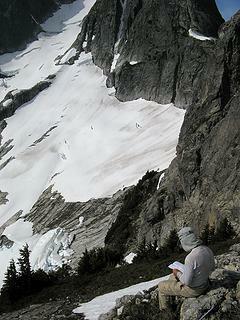 Looking back at the first snowfield and talus basin. Even though we were in bright daylight, it felt like a blind descent, feeling our way down one piece at a time, praying that each next piece would appear when we needed it. And our prayers were answered, as true prayers are, at the junction between our hearts’ desires and the world’s potential, by attending to what's offered and investing ourselves to find a way through. There we create the openings for grace and joy to enter our lives. Paying attention to what’s around us, choosing what seems good, and committing ourselves to follow through. It’s a commitment of mind and body, but just as much of heart and soul, to find what’s best and do our best. Thus inspiration becomes action, and hope becomes reality. 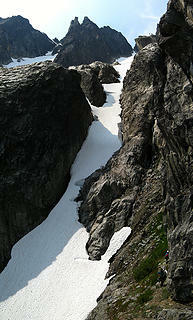 At the corner between the pass and the cirque wall stood our first obstacle. A snow slab had collapsed into a pile of blocks. 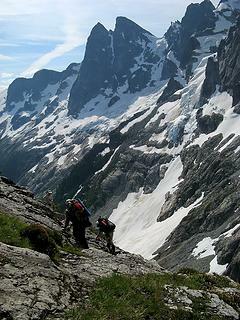 We bypassed them by walking up and around on the slanting rock slabs above the collapse. Now we needed to find a key ledge. 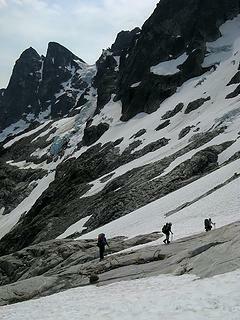 Somewhere ahead was a steep vertical-walled gully slicing down through the slabs. Nearby was supposed to be a ledge that would get us through the wall of the gully. Amid the snow, it was hard to see, but Billie spotted a couple flat spots where it crossed some vertical ribs. We followed the line, and there it was. Where the ledge entered the gully, something magical happened. At the junction of sheltering walls, falling water, and flat surfaces, life flourished! 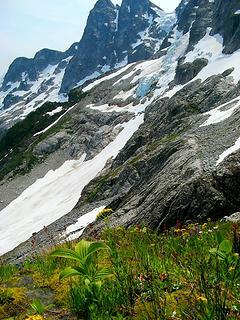 Everything all around was bare rock and ice, but where the ledge cornered into the gully, suddenly we were walking through a verdant flower garden. The garden ledge was a fitting entry to the gully, because the whole thing was like an enchanted passageway, designed to charm and awe the senses, while ushering one down to the bottom of the cirque. 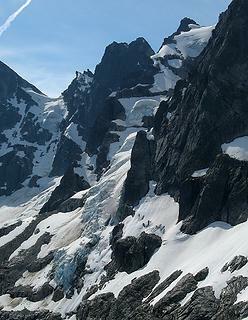 ...A vertical slot cutting the cirque from top to bottom. ...Pointy spires rising above its apex. 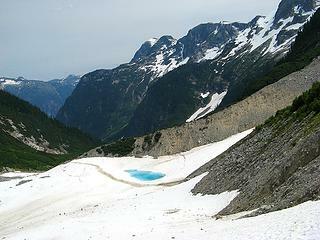 ...A crystal blue lake floating atop wide snow at the bottom. ...Steep cliffs guarding each edge. 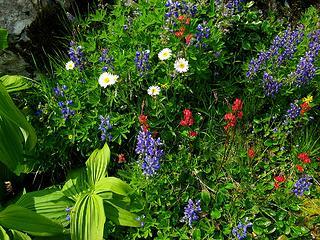 ...A garden clinging to the west side. 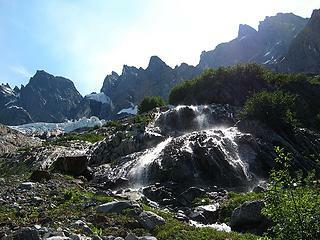 ...Sheer waterfalls streaming off the east side. ...And a white pathway of snow descending all the way down the center. 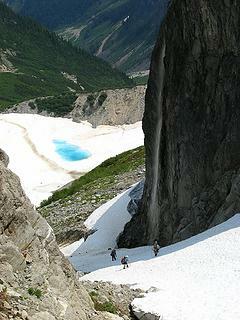 Altogether, an invitation to revel in its beauty and travel its pathway down the depths of the cirque. 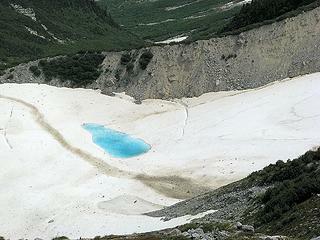 Below the gully was a wide snow basin with a sapphire blue lake at its center. The deep snow had collapsed downward into the lake but not yet melted, so that the whole blue lake lay nestled atop a white bowl of snow. I so wanted to run over and swim in it, but we still had to get back up the other side of the cirque, so we passed on by. 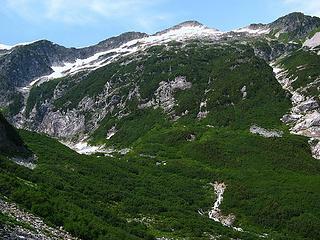 At the far side of the basin was a moraine marking where the glaciers had once stretched all the way down to the creek. 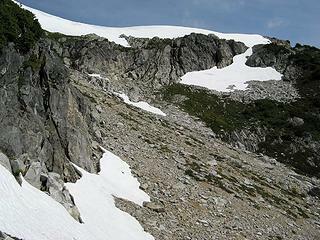 Above the moraine was the cliffy wall of The Barricade. To get around, we descended the headwaters of McMillan Creek down to about 3900 feet, and then worked our way up boulder fields and brush bands on the far side, staying near the edge of the Barrier to avoid wider brush. We hiked up snow a couple hundred feet. Beyond was a wide band of brush separating us from the open rock. Earlier Mike had spotted a stream cutting a vertical path through the brush, so we got through by hiking directly up the stream bed. 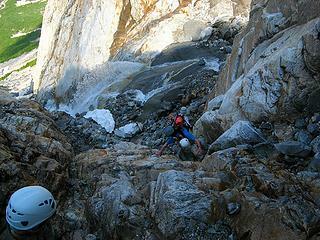 The next obstacle was another cliffy gully, bordered by steep orange slabs. We could see a few ledges on the far side of the gully, and debated which one to aim for. The slabs looked too steep on this side, but Mike picked a route and led the way through, with some damp 4th class scrambling to get down into the gully. Crossing below the McMillan Glacier was a straightforward walk across slabby ledges that had been polished by the retreating glacier. Just don't look up at what's hanging above those slabs. But the blue glow of the broken ice faces above us was just too pretty to ignore, at least for quick glances while hurrying below their perilous beauty. 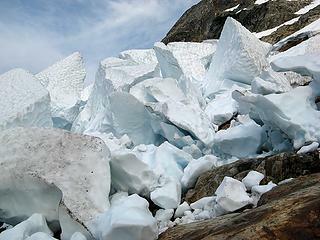 Beyond the glaciers, another snow slab had collapsed in to a pile of giant blocks. This one had no easy bypass above, so we crossed below it, skirting right next to the blocks on the rough rock. At one point, the snow groaned as I walked past, and I quickly reached out to steady it, as though I would someone hold up the enormous block with my hand if it decided to move. Then it was another couple hours of kicking steps up snowfields to reach the 6350-foot col east of East McMillan, just west of Point 6752. 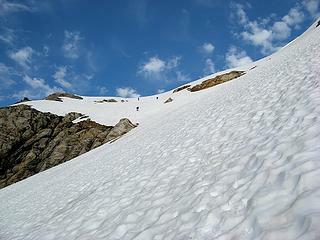 The col itself was corniced, so we had to go up a little higher onto the ridge and walk down into the col. Behind us, puffy clouds gathered and spread across the crest. 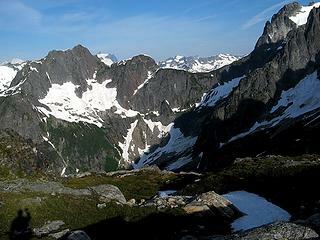 We stood on last major divide of our trip, with McMillan Cirque behind, and the deep forested valley of Stetattle Creek ahead. 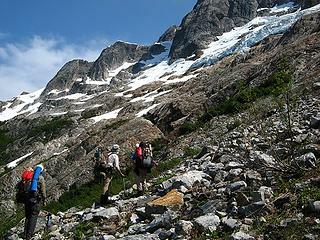 Hiking up to camp, with Jack Mtn and Stetattle Ridge ahead. We placed our camp a short distance farther up the ridge, on a flat area just east of Point 6455. The rock benches weren't flat enough for a tent, so Mike dragged flat stones onto the snow to pave an insulated floor for our tent. 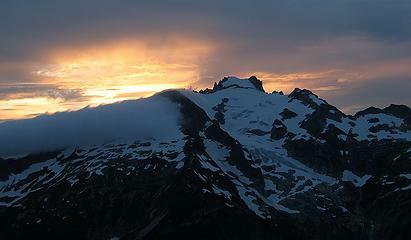 At sunset, hot orange light lit a burning glow on the edges of the gray clouds and dark peaks. After dark, I was looking south down the dark valley, and realized that I could see a faint light far in the distance below. Somewhere past the dark jungle of the creek valley, the lights of Diablo were shining. Yes, lights and home were out there somewhere, but still a long two days of cross-country travel away. great perseverance matt, both in the trip and finally writing the TR. 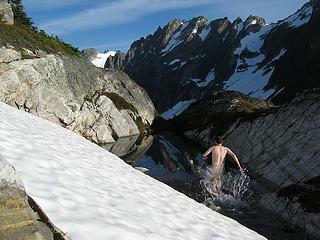 we are all grateful for the splash of water in your tarn swim photo those snowblocks are huge! scary, it must have been, to walk beneath them. that whole area looks scary! picket pass campsite = ! Thanks for continuing the story I've gone back and drooled over the previous entries many times. Your description of the descent from Picket Pass is just what I've feared...made worse by the fact that you can't see what you're getting yourself into. Beautiful writing. And I love the shots of McMillan Spires from below. Thank you so much Matt. An inspirational TR with such great route description and art! All the pics are nice, but this one in particular is stunning. 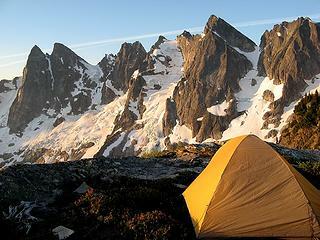 The Pickets to me are almost mythical, I doubt I'll ever traverse them, but it's great seeing a shot like this. Thanks for sharing. This will help me immensely on my pickets traverse this july...thank you so much Matt! The Garden and The Gully were amazing, nice shots of an awesome area! Wow, what a treat; I wondered if I would ever see this! You are a master of trail reports Matt! The narration and photos are wonderful. Two points I might add for interested parties. We did the same exact route as outlined here except did it in much drier conditions (a low snow year) and my recollection and comparison to Matt`s great TR was, it was likely easier. 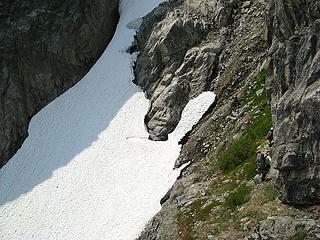 I also did a variation of the PT last summer in snowier conditions and found it conversely more challenging. 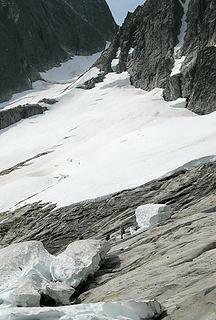 I usually find traverse travel with high snow levels an aid, but think the Picket traverse might be the exception. 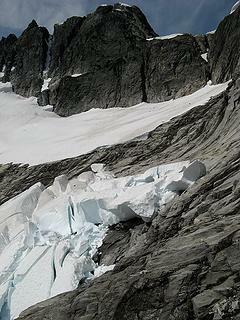 One point to consider in a low snow year would be the crossing of the crux gully between Pickel and Picket pass which would be more difficult. 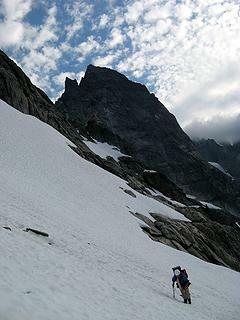 We had to make a somewhat difficult brief climb up the Picket pass side that could be worse in a lower snow year than the one we had. I should add, we started the traverse from Big Beaver up to Eiley/Wiley and avoided the low snow difficulties of the Watcom glacier as well as the Perfect impass problems. In addition, I have to say, my recollection of dropping off PPass was not so bad. Maybe my memory is poor or I was younger and stupidier; but another possibility is we found an easier line down to the waterfall gully, but I don`t have such detailed pictures to suggest to others an easier route for those interested. I found the notes from Routes and Rocks very instructive for those interested (Becky, I believe uses Tabor and Crowder as his source). Another 5 years later? I hope not, for that was an excellent read. Thanks! Fantastic! excellent pics Matt, thanks for putting this together. Never seen the enchanted gully and now I want to, want to ski right through it, but in slow motion so that I don't miss a thing! Snow coverage looks more like August than July, did it melt out faster in 08? Fantastic. I expect these details to get me down Picket Pass in July.